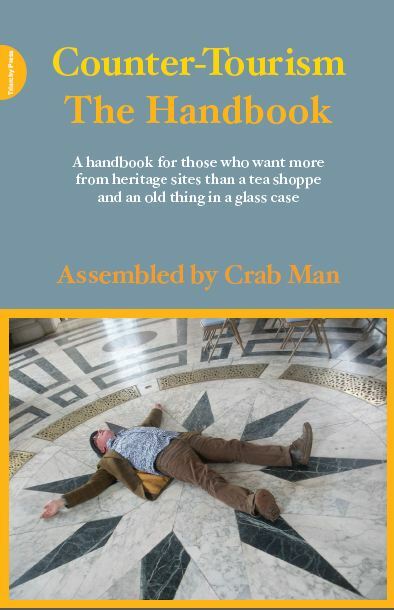 Counter-Tourism is a term coined by writer and performer Phil Smith (aka Crab Man), and is described as a series of "tactics (which) are designed to transform the way you look at places and to get you thinking about the way the industry packages 'heritage'". Far from being elitist and snobbish (according to Phil, counter-tourism is "definitely not about sneering at tourism"), the philosophy is in fact geared towards "those who want more from a heritage site than a tea shoppe and an old thing in a glass case". I am a big fan of Phil's playful writing and films, and interviewed him on this blog after the release of his previous book, entitled 'Mythogeography'. Counter-tourism takes many of the ideas developed in that publication, and applies them specifically to the heritage industry. Phil's theories are outlined in a handbook (described by his publishers as being "the definitive guide to Counter-Tourism, except that Counter-Tourism has a low opinion of definitive guides"). Alongside this guide is a smaller counter-tourism pocketbook, containing suggestions for "50 odd things to do in a heritage site", and there is also an online resource where people can share tactics. My first thought when reading his texts is that there is probably less of a need for counter-tourism in France than there is in the UK or the US. 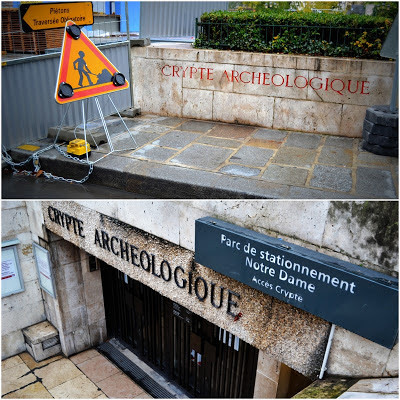 Heritage sites in France do not have grafted-on ghosts, or staff members wandering around in 'period' costume, and are generally bereft of cheesy documentation and 'as featured on TV' signs. That said, the entire city of Paris has become something of a tourists' theme park, with a series of attractions that people feel obliged to visit. By blindly following guide books and official tours, most tourists will miss the opportunity to get a real feeling for a place for themselves. Counter-tourism tactics can help them get off the beaten track whilst still visiting the city's principal heritage sites. The tactics need not only be for tourists, and can also offer a way for locals to discover sites they have abandoned to visitors from elsewhere. This is certainly the case for me with Notre Dame. Being the 'point zero' of France, it seems that it must be infused with genuine signification. As Joanna (@Baudade) pointed out to me on Twitter though, "Notre Dame might itself be counter-touristic. I've spent so much time nearby but strange force field's prevented me from ever going inside". It is clearly a must-stop site for tourists today, even though it had previously been reduced to a desecrated glorified storage space after the French revolution and was very nearly demolished. It was saved in part by the fiction of Victor Hugo, who in doing so created new myths for the building. Was Hugo then the first counter-tourist? With pocketbook in hand (which I must say would make an excellent stocking filler for anyone who is a reluctant tourist - or even just a tourist! ), I set off to visit Notre Dame as a counter-tourist, and to see if I could make some tactics of my own. The visit to Notre Dame begins on the parvis. By the 1960s this space had become a giant car park, crammed at all hours with tourist buses. In an attempt to clean up the site, the city authorities decided to put everything underground. You will notice that the 'archeological crypt' was placed directly alongside the underground car park, and that they share the same entrance. Instead of visiting the crypt (which is also currently closed for a few weeks), why not instead visit the car park, and imagine the cars as important sarcophagi or relics? Instead of visiting Notre Dame, visit the Hôtel Dieu hospital or the Prefecture de Police instead. Both were built alongside the cathedral during Baron Haussmann's 19th century reconstruction of the city, replacing the original medieval street layout. As they have been given equal space on the Ile de la Cité, they must be just as important. Notre Dame site managers have rather handily just installed a grandstand in front of the cathedral as part of the 850th anniversary celebrations. As the building has clearly become something to watch, why not visit it as if it were a football match or opera performance? Alongside the cathedral is the 'Notre Dame' café tabac. Visit this establishment as if it were the cathedral. Ask the manager for a guided tour, and talk only in whispers. At the beginning of the pocketbook, Phil Smith points out that "there are only two ways you can do these tactics 'badly': hurt yourself or reduce other people's pleasure." Although tactics should transform your experience of a site and subvert the heritage industry, it should also be remembered that Notre Dame is a sacred site for some people, and therefore it's probably best not risk upsetting them or injuring yourself by shinning up the walls. Inside the church one thing is immediately apparent. There is a clearly defined and signposted flow. The entrance is on the right-hand side, the exit on the left. The church must therefore be visited in an anti-clockwise direction, ending - of course - at the gift shop. 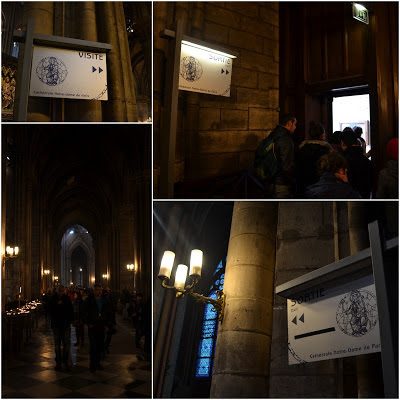 The first tactic when inside Notre Dame is therefore to walk in the other direction, and literally see the building from a different angle to all other visitors. One of the 50 tactics in the pocketbook encourages you to "visit gift shops as if they were the museums." By visiting Notre Dame in the 'wrong direction', you can first admire cut crystal trinkets and praying dolls before going on to the altar and transepts. Or to confess. Play chess on the checkerboard floor tiles. Come dressed as a king or queen - you'll feel at home in this most royalist of French churches. 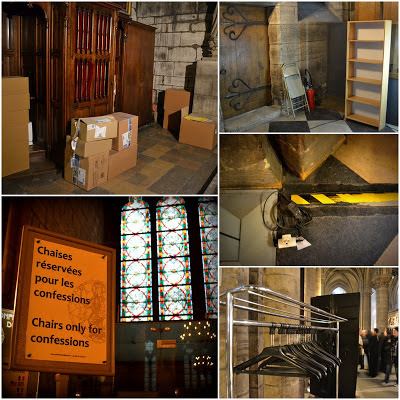 Investigate and photograph the practical equipment and temporary storage spaces around the church. Not only will it bring to mind the revolutionary warehouse it once was, but you'll also soon notice that it is really quite a scruffy place - and very much alive! Finally - and most important of all - enjoy yourself and have a good time! As Phil concludes, "when Counter-Tourism opens the doors, tourism becomes a funny, subversive and adventurous experience - not a deferential procession through the unrevealing homes and castles of Heritage plc." 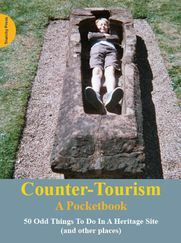 Phil Smith's Counter-Tourism - The Handbook and Counter-Tourism - A Pocketbook are both available from Triachy Press. Heritage is what is left with a trace of a longstanding history. This needs to be showcased but not exaggerated. Excellent. Will definitely be trying out the giftshop-as-heritage tactic sometime soon. Also like the idea of going against the flow, which is possibly something that can be attempted in an Ikea store. Hmm. So I've been doing counter-tourism for years without even knowing it. The title of one of my first tourist photographs in Paris was "The Eiffel Tower", because it showed the basement of one of the pillars (which is a big stone you could see anywhere else). Years later I grew older and started buying Michelin guides. I guess I'll have to elaborate some kind of counter-counter-tourism, to avoid being assimilated to the crowds of counter-tourists. For example, I could go to Notre-Dame to perform such a bizarre act as attending the Mass. This is so much fun to read, Adam. Love the blog even more now that I live here. Thanks! My ex-husband and son had this phenomena sorted to an art: We were once in a fancy hotel for hols and both guys started their buffet meals the other way round: First the desserts, than all the way back to the starters... I couldn't do it and didn't like it but hey, it worked for them - no hassle, no pushing, all very civilized! And I bet, the owner of the ND café will LOVE to be constantly asked for a guided tour in a whispered voice from today onwards... ! I definitely love starting my tours with the gift shop... again; I love the 'déjà vu' feeling when I see the original I already bought as a postcard - tiny pleasures but nontheless pleasures! 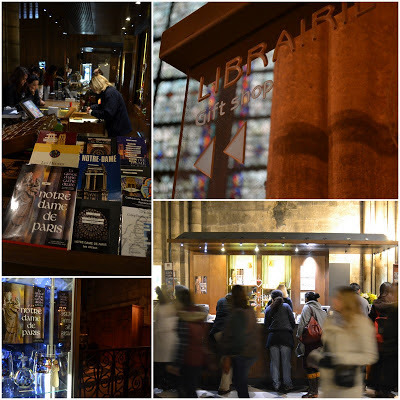 @thbz When I visited Notre-Dame it was Christmas Day so I stayed for the mass! In a completely respectful way, of course. I loved it.